There was no shortage of massive, wide-reaching recalls that affected children in 2016: the 29 million top-heavy IKEA dressers that could tip over, McDonald’s 29 million Happy Meal fitness trackers that caused rashes and burns, and three million Tommee Tippee’s spill proof cups that grew mold. Each of these campaigns — and many others — contributed to the largest increase in recalls, injuries, and incidents involving children’s products in nearly a decade. That’s according to the annual Kids In Danger (KID) report [PDF] — A KID Report Card: Children’s Product Recalls in 2016 — that found there were 76 children’s product recalls in 2016, an increase of 13% from the number of recalls issued in 2015. Those 76 recalls covered about 66.8 million total units of children’s products, KID found, the largest number of individual products recalled since 2004. KID found that the distinct increase was the result of two major recalls: McDonald’s fitness trackers and IKEA’s dressers. Still, even if those recalls hadn’t occurred, 2016 would have seen more than 10 million units recalled, nearly double the five million units called back in 2015. Recalls in 2016 covered all product categories, from nursery items to furniture and utensils. Three manufacturers accounted for multiple recalls, according to the report. In addition to recalling millions of dressers, IKEA also recalled safety gates, bat cape costumes, and drums and drumstick sets. In all, the company accounted for 49 injuries and seven deaths. The number of incidents, injuries, and deaths tied to these recalls also increased sharply, the report found, with a total of 4,842 incidents, 394 injuries, and seven deaths reported before the recalls were issued. But even the large number of incidents, injuries, and deaths failed to spur manufacturers to act quickly when it came to dangerous products, KID found. This is a big problem with the recall process, according to the agency. In fact, the new report found that on average it took 64 reports of serious design flaws and failures to pull dangerous products from the shelf. The large number of reports needed before a recalling a product in 2016 is a stark contrast to the level needed in previous years. In 2015, there was an average of 12 reports before products were recalled, and in 2014 that average was just five reports. “This demonstrates a growing issue with recall speed, and we hope that these unfortunate statistics encourage manufacturers to act more quickly in order to remove dangerous products from consumers’ homes,” the report states. Overall, the report found that there were 4,842 incident reports filed before a recall was issued in 2016, a 492% increase from 2015. Tommee Tippee cups received the largest number of incident reports at 3,066 reports, while Hillsdale Furniture’s Children’s Bunk Beds accounted for 650 reports, and Pacific Cycle’s Instep and Schwinn Swivel Wheel Jogging Strollers came in third accounted for 132 incident reports. When it came to injuries, the report found that 25% of children’s product recalls involved injuries prior to their recall. That translates to a total of 418 injuries, a sharp increase from the 36 total injuries reported prior to recalls in 2015. 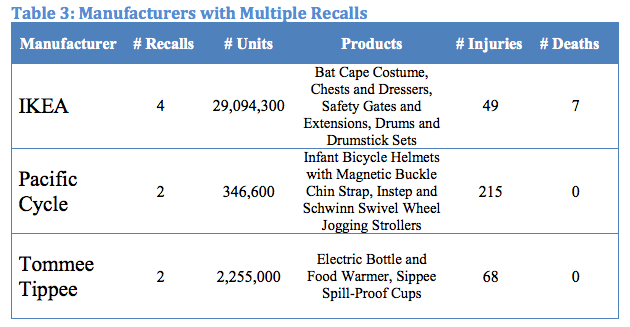 Pacific Cycle’s Instep and Schwinn Swivel Wheel Jogging Strollers received 215 injury reports prior to recall, Tommee Tippee’s mold-growing cups received 68 injury reports, and IKEA’s dressers received 43 injury reports before recalls were initiated. Tragically, there were seven deaths linked to recalled products. These deaths, while they occurred in earlier years, were tied to IKEA’s recall of millions of MALM dressers in 2016. While the report found that manufacturers could do more to identify potentially dangerous products and move faster to get the products off the market, KID also found that some companies are doing better about getting work out once recalls are issued. The report found that 59% of companies with a Facebook page used it to contact consumer about dangerous products. 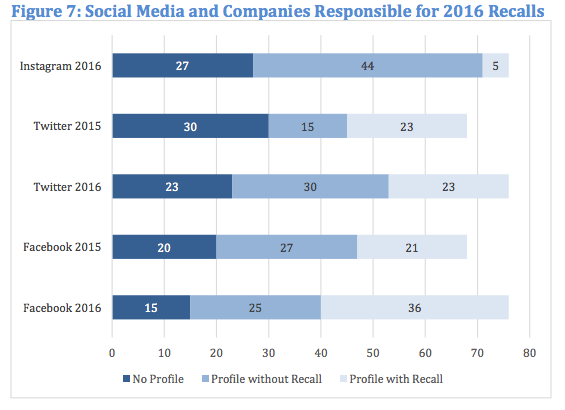 Despite this, the report found that the amount of companies posting on Twitter about their recall decreased slightly from the previous year. KID notes that the most recent report shows that there is still a long way to go before child product safety becomes acceptable, but that manufacturers, retailers, and consumers can take steps to improve the process. KID recommends that companies move more quickly to report and recall products that cause injuries and deaths, consumers should be aware of recalls and know how to comply with them, and the CPSC should focus on recall effectiveness by strengthening and better enforcing requirements for progress reports and other requirements of corrective action plans.